Many of the users admired the overall comfortable feel of the Reebok Harmony Road because of the combination of the upper’s seamless construction and the soft nature of the material. The mesh upper is very breathable, as noted in some comments. Some of the runners were happy with the shoe’s lightweight construction. A lot of marathoners said that they were happy with the long-lasting cushioning of the shoe. Several wearers mentioned that they did not experience heel pain because of the good heel cushioning of the Harmony Road. Some of the users with medium foot measurements appreciated the wide toe-box, which allowed their toes to move freely while running. A majority of the runners were happy with the shoe’s high-quality construction. A significant number of wearers lauded the good-looking design of the shoe. It runs true to size, according to some users. A few number of runners mentioned that the shoe felt too narrow for their feet. A couple of purchasers found the Harmony Road slightly expensive. Overall, this running shoe gained a positive impression from road runners and marathoners. They were generally satisfied with the shoe’s performance-driven design and the innovative technologies incorporated into it. With its long-lasting cushioning, the Harmony Road is best for long-distance running. Who will benefit from running and training in Reebok's Harmony Road running shoe? See the verdict below. When I opened the box containing the Reebok Harmony Road shoe my first thought was, “I already have these shoes!” That’s because they look uncannily similar to a pair of Nike Air Structure trainers from a few years back. Not that I run in the Air Structure, a heavy shoe with over-the-top support; it makes for good walking and doing errands shoe. The Harmony Road sample provided by Reebok weighs 10.7 ounces and has a heel drop of…Wait for it… 13.2 mm. Wow! These days that’s considered awfully high. Some serious heel stompers will think that Christmas has come early. When I put the Harmony Road on my feet and began to walk, I discovered that this is an ultra-smooth walking shoe. In fact, I doubt that I’ve ever encountered a more comfortable shoe to walk in, whether the shoe was labeled as walking or running shoe. Is the shoe just as comfortable while one’s running in it? Well, the heel plant on the Harmony Road is relatively firm and the ride provides what I would term cushioned firmness. A few years back I found myself in Palm Springs on a business trip and decided to pick up a pair of New Balance trail shoes to run through local desert paths. The Harmony Road reminded me of how those New Balance trail runners felt. The Harmony Road’s seamless upper provides plenty of room for the toes, especially the smaller ones. This is not a shoe that requires you to wear super-thin socks so that you can get your feet into it. And the flat, patterned laces do their job and stay tied. While the Harmony Road is labeled as a neutral shoe, it is quite stable. The build quality is evident and the shoe should be exemplary in its durability. (After many miles of pounding on asphalt and concrete in the Harmony Road, there’s little apparent wear on the sole.) There are three visible forefoot flex grooves on the Harmony Road’s sole. But the actual flexibility upfront is limited. Interestingly, I found the limited flexing to be on a par with the old Nike Air Structure. Also on the forefoot sole is something that Reebok calls the Power Pad. It’s a small rectangular box that states, “Be more human” on it. I have no idea what it does because I never felt that the Power Pad came into play during runs in the Harmony Road. The Harmony Road has some unique midsole KooshRide filling developed by 3M. In theory, this makes the Harmony Road’s ride extremely responsive. OK, but I would grade the responsiveness of this shoe as a C+ to B-. There is some spring but not as much as you’d find, for example, on the Saucony Ride 10 (a model I would give a B+ to A- for responsiveness). It’s possible that one needs to be a bigger, heavier runner to feel the Power Pad in action and to experience the full measure of “bounce back” from the Harmony Road midsole cushioning. One highly positive feature of the Harmony Road is that it offers the full range of foot movement as a trainer. You can feel your foot transitioning from heel to mid-foot and onto the forefoot. In this, it offers a nice, relaxing measure of smoothness. There is no problem in landing on one’s heels or mid-foot in the Harmony Road, but the high heel drop level makes it quite problematic for those who land on their toes. The positive and less-than-fully positive aspects of the Harmony Road results in a somewhat mixed verdict. This is not a shoe that one would select for speed training and it’s not the shoe for PR attempts. However, most runners will find times when they need a recovery shoe or a long mileage trainer that protects their feet as they recover from a temporary injury. The Harmony Road is a fine choice in such times. The Harmony Road is also a good choice for long slow distance training. I think it’s just about perfect as a model to use for 7 to 10-mile runs. The shoe is massively protective while not feeling heavy and bulky like a support shoe. Finally, the Harmony Road is a great choice as the “first shoe” for the novice runner. The shoe’s smooth uniform cushioning will build confidence in newbies as they pile on the miles. This shoe, which retails for $119.99, will be as good for their heads as for their legs and feet. Well recommended. During the runs, I really enjoyed the shoe. I don't really think that these shoes really excel in any one area but I feel like they're good in just about every area that pertains to running shoes. I can say that I was happily surprised with the Reebok Harmony Road. I put 50 miles on the shoes over the last few weeks and they’ve held up great. The Reebok Harmony Road delivers a smooth in-shoe feel and breathable coverage through the seamless SmoothFuse upper material. It is lightweight and has a smooth lining that provides the foot with an irritation-free environment. The shoe features the new Tri-Zone midsole technology that efficiently absorbs shock in the heel and delivers responsive propulsion in the forefoot area. It is specifically designed for a smoother and balanced ride. The Harmony Road also features the innovative and performance-driven KooshRide core technology that is designed for long-lasting cushioning. This technology was engineered from a TPU foam for a highly-responsive running experience. In the forefoot of the shoe is the PwrPad technology. This convex rubber is designed to deliver a faster and more powerful toe-off. The Reebok Harmony Road generally runs true to size. 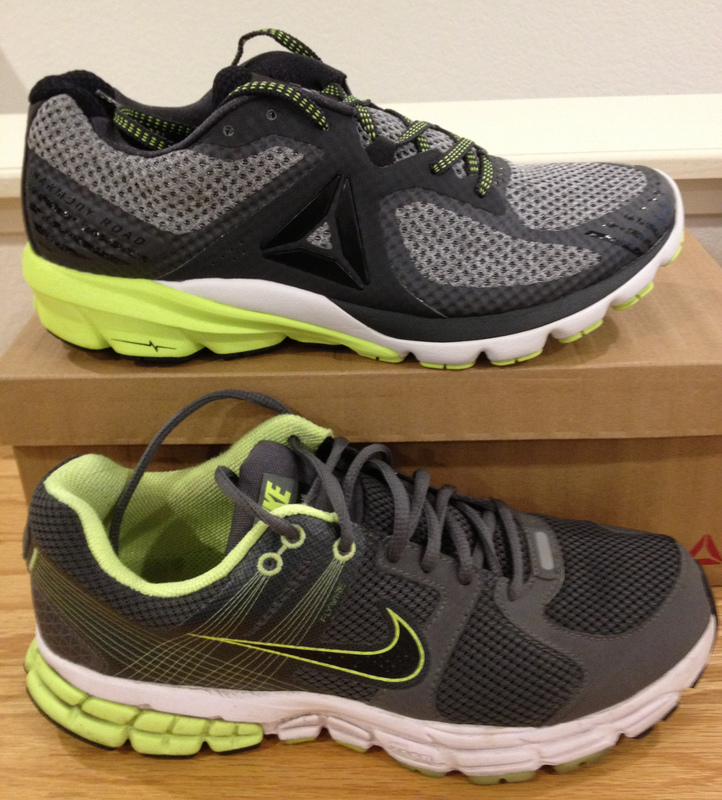 This neutral road running shoe is available in a standard medium width for both women and men’s version. It has a nice fit for those runners who have medium foot measurements in the heel, mid-foot, and forefoot. In the outsole of the shoe is the high-abrasion carbon rubber material that delivers durability in high-wear areas. The carbon rubber gives added cushioning and provides reliable traction while running on the road. For a more powerful toe-off and enhanced performance, a PwrPad technology is also added in the forefoot. It’s designed to accommodate the natural position and motion of the foot as it prepares itself to lift off the ground. This outsole element is also used in the Harmony Road 2. The Reebok Harmony Road utilizes the innovative KooshRide core technology. This performance-driven technology was engineered from a TPU midsole foam that’s placed into the inner section of the platform. Its purpose is to deliver long-lasting cushioning that’s ideal for long-distance runs. For a smoother, faster heel-to-toe transition, and balanced ride, the shoe uses the Tri-Zone midsole technology. It is designed for a responsive propulsion in the forefoot and reliable shock absorption in the heel. A mix of synthetic fabrics and mesh make up the main upper unit. The open construction of these materials ensures seamless airflow into the foot-chamber, thus maintaining a cool and dry environment for the foot. The SmoothFuse technology is an overlay system that is printed directly to the upper unit. It blends seamlessly with the fabrics, giving a premium and sporty look. It also accommodates a more secure fit because it helps the rest of the upper materials in hugging the foot. The shoe’s softly padded tongue and heel collar provides added comfort and enhanced fit. Also, the flat laces hold the foot securely and remain tied for the duration of the run.